Ortega Village Center offers inviting retail spaces set in a classic Mission San Juan-style, uniquely surrounded by lush courtyards and fountains, all professionally maintained. Shops range in size from 900 sq. ft. up to 6,000 sq. ft. 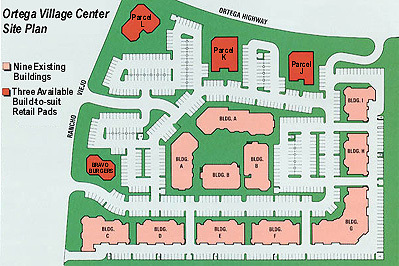 The full service Professional Office Building is at the hub of the Ortega Village Center. It includes all of the modern conveniences of north Orange County, but without the congestion. Located just off the Interstate 5 Freeway and midway between Los Angeles and San Diego. It features a two-story, multi-tenant office building containing over 32,800 sq. ft. of prime custom business suites, ranging from 500 sq. ft. to 7,200 sq. ft. The commercial service buildings, featuring additional storage and distribution areas, are designed for comfortable office, successful retail or related business service tenant use. These unique, versatile suites range in size from 1,000 sq. ft. to 8,000 sq. ft. Whether you live in San Juan Capistrano or simply desire to locate your firm in an outstanding business environment, we offer you this unparalleled opportunity to be a part of a dynamic professional community. We invite you to join the successful firms who have located in the Office Cottages at Ortega Business Center. 500 sq. ft. to 15,000 sq. ft.